Home study course with CE credits. Tools and techniques that bring ease & passion to teaching. Teaching can be fun and rewarding and can make a powerful difference in someone’s life. But teaching can also be confusing, frustrating and, at times, overwhelming. Today’s classes are made up of diverse populations, from baby boomers to Gen Y’ers and all those in between; from all ethnicities, economic and cultural backgrounds and myriad experiences. 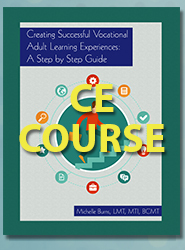 This creates a diverse tapestry of resources, opportunities and challenges for the adult student and the teacher. Teaching adults effectively and easily is a skill that can be learned or enhanced with an understanding of some basic theories and methods. With the right knowledge and tools, those challenges can be turned into strengths to make the classroom experience fun and successful. how to create a class that allows the instructor to be relaxed, confident and have fun too. This information is applicable to anyone planning to or currently teaching adults.